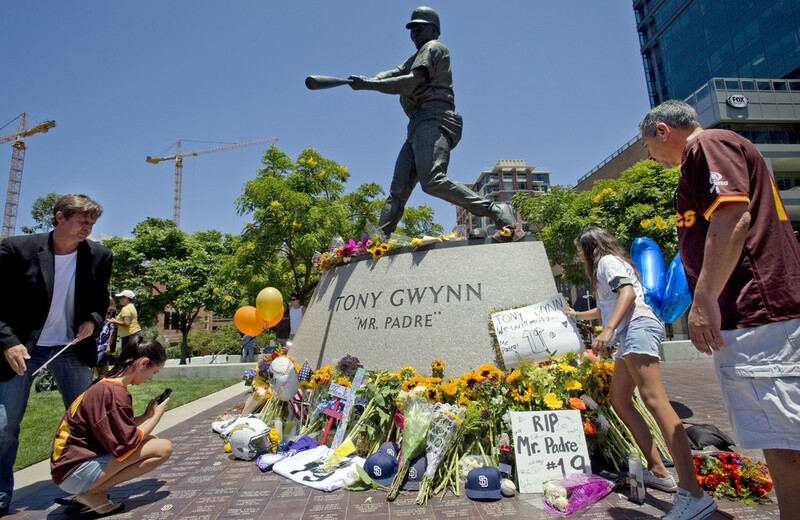 Tony Gwynn the former All-Star in Major League Baseball and a member of the Hall of Fame has died at the age of 54. Gwynn spent each of his 20 years in the majors with the San Diego Padres of the National League. Gwynn was on medical leave since March from San Diego State where he was the baseball coach. The school was his alma mater. He died in Poway a suburb of San Diego said John Boggs his agent. Bud Selig the MLB Commissioner said that for over 30 years Gwynn was a universal goodwill source for the national pastime and will be missed deeply by all the people he has touched throughout his lifetime. Gwynn went through two cancer operations between August of 2010 and February of 2012 for cancer on his cheek. His second surgery had complications as surgeons had to remove a facial nerve. They grafted another nerve from his neck so he could regain facial movement again. Gwynn believes that the cancer originated from the time he chewed tobacco. Tim Flannery the current third base coach for the San Francisco Giants played with Gwynn for a number of years and then was his coach. He said he will remember Gwynn’s laugh and that the incredible hitter was always happy and always talking. Flannery said baseball and the world in general would miss a great person. He cared for others and had a work ethic second to none. Gwynn finished his career with 3,141 hits and a lifetime batting average of .338. He won eight battling titles in the National League and loved to hit singles to the opposite field. Gwynn appeared in two World Series with the Padres and was an All Star 15 times. Gwynn retired from baseball following the 2001 season. He was inducted into baseball’s Hall of Fame with Cal Ripken in 2007. Gwynn starred in two sports at San Diego State playing baseball and point guard on the basketball team. One of baseball’s greatest and likely its nicest is survived by Alicia his wife, Anisha his daughter and Tony Jr. his son, who is a player with the Philadelphia Phillies.